The sock choice for Burns Night, Hogmanay and any gathering of the clans, these Scottish heritage style HJ Hall Thistle Wool Mix Kilt Socks make the ideal, cost-conscious accessory for any traditional outfit. 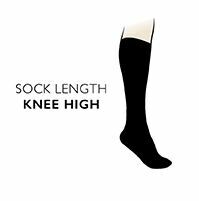 Embroidered with a thistle on the turn over top, these ribbed leg kilt socks are made using a wool mix yarn for a traditional look and feel, crafted to fit above the calf, but slightly below the knee, just as they should. The wool mix, besides being affordable, is also durable and fully machine washable for ease of care and long life.